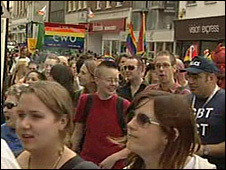 Hundreds of people turned out today for Cornwall's first ever gay pride parade. More than 600 people took part in the march, designed to promote diversity, with many more lining the streets of the city to watch the spectacle. Devon and Cornwall Police were among the many local supporters of the event, and the Gay Police Association flag was flying at Truro Police Station. The event started at 1100 BST and featured stalls, dancers, singers and comedy acts. The parade - which had a theatrical theme - made its way through Truro City Centre starting at Lemon Quay and ending at Victoria Park. Organisers say there has been so much support they want to make it an annual event. Chairman Christian Diamant said: "I could never have expected this to be as colourful and had the reception it has. "They (the crowd) were cheerful, they were amazed, they were intrigued and that's the whole point of Pride. "We got a good message across and people had a good time." As well as the parade there is a musical event in the city on Saturday night.